View Poll Results: As a home inspector do you test for mold? Thread: Do you test for Mold? Mike Lamb has asked me to create this poll. A recent Chicago Tribune article (January 6, 2013) contained the following statement under a photo on the front page of their Money & Real Estate section. 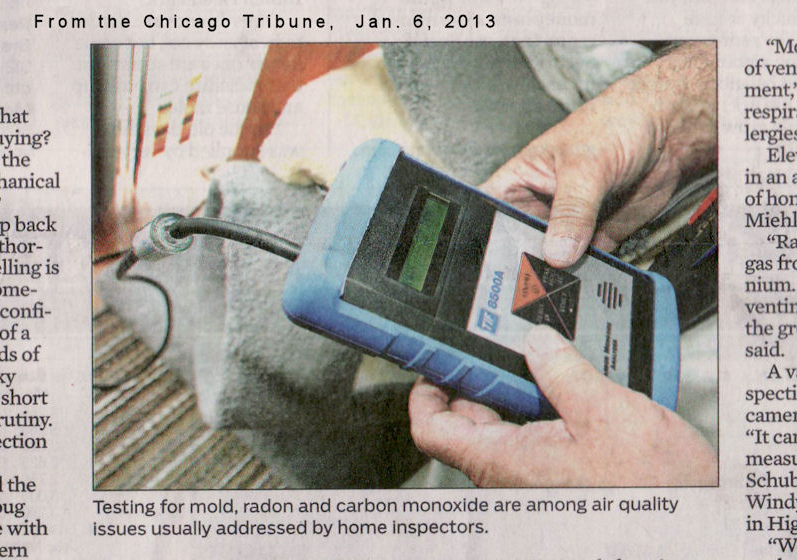 "Testing for mold, radon and carbon monoxide are among air quality issues usually addressed by home inspectors." This statement was accompanied by an article on home inspections called, "Sizing up a home." The Chicago Tribune's total average circulation, including print and digital, was 414,590 for the six months ending March 31, 2012. Please just answer the survey and do not provide comments as to what your opinions are on testing for mold. If you are compelled to comment, start another thread. Re: Do you test for Mold? We offer a "mold screening test," where we take a swab of the furnace filter and send it to a lab for analysis for a few very specific mold types, such as Stachybotrys ("black mold"). We had an inspection last week that had the first positive Stachybotrys test we had seen. Generally, we tell our clients that unless there is someone in the household with severe allergies or a compromised immune system, mold testing really isn't necessary. Just be vigilant about moisture control. "Given sufficient thrust, pigs fly just fine." Welmoed, what do you charge for a mold screening test? What protocols and standards do you use? We charge $50. The kit from the lab comes with nitrile gloves, collection swab (basically a giant Q-tip), and a tube to put the swab in and seal. The kit is shipped to the lab and we get the results in a few days. We take great pains to explain to our clients that this is only a SCREENING, not a comprehensive mold inspection, and only shows whether the tested area has mold growth. It's not going to tell them whether there's mold growth in other areas of the house, or hidden behind walls. A superfulous service? Or piece of mind for the owner? Since the test really doesn't indicate much, if anything is there piece of mind for the price? I guess if people are willing to part with $50; go for it! More and more people are concerned about mold today,any advice or services an inspector can give is better than nothing. We are in a service industry and if there are signs of organic growth it is a service to our customers to test and inform them. That being stated we must also be careful to add context and make sure we do not go outside of our training. Customers frequently ask should they test for mold??? my usual answer is that testing for "things" without a reason does not make good sense. However if they have environmental allergies or respiratory issues; and if there are signs of growth I may suggest they test or if I suspect the issues are greater I may refer it to an industrial hygienist. Only if that advice is for the betterment of the client and not to enrich the inspector - and the information is truthful (i.e., tell 'em "It ain't the mold that is the concern, folks, it's the water and or moisture penetration which is leading to the mold growth. THAT is what needs to be dealt with."). Like many things, whether to test or not to test is how you have been trained. Having taken the CMHC indoor air quality investigators course, they prescribe not to test for mould, but to investigate the cause (water infiltration) and clean up with soap and water, and or removal of contaminated surfaces if they cannot be cleaned. Sometimes the buying public has been fed more information than we can hope to overcome and mold is a prime example. Consumers have been conditioned to believe that black mold will lead to brain damage and death. And when stories of houses being gutted and rehabbed for hundreds of thousands of dollars over mold are out there, the consumers are just not going to be on board with our stance. I offer mold/air quality sampling through an environmental testing facility and some people want it regardless of what I find in the house. Why do I offer it? Some people want it. Personally, I grew up with mold/mildew growing on spots of the drywall in my parents' basement but I am still alive today and suffer no ill effects from it. Some people however have tests done by an allergen specific doctor and are told they are highly allergic to mold and cannot live in a house that has it. How do you override the advice they received from their doctor? It is what it is. Some people hear mold and will freak out regardless of what you say. Personally, I don't think it is our responsibility to change their minds. I just give them information and what they do or don't do with that info is up to them. Last January I tested my home for mold. I think we should check at least once a year. Why would you spend money on something which has no value? Are you allergic to a specific mold? If so, was the test done for that specific mold? If not, again, wasted money with no meaningful results. Something to keep in mind: Mold is the 4th most common type of claim against home inspectors. However, the majority of mold claims are against home inspectors who DO NOT inspect for mold. We did a couple of articles on the subject in hopes of giving inspectors some risk management tools to better avoid mold claims as--as I'm sure you already know--most mold claims go beyond the scope.